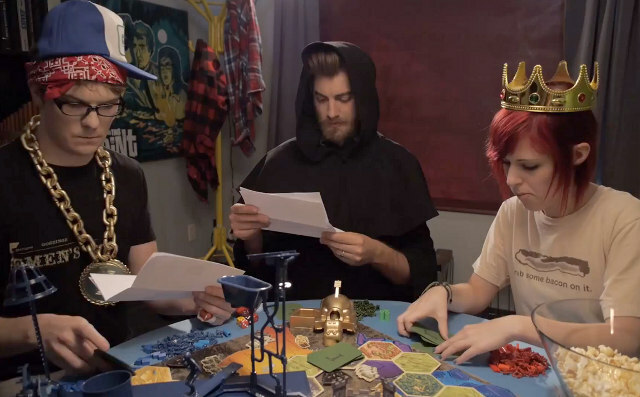 The Easiest & Most Difficult Board Games EVER! I found these 2 funny items relating to board games, & realized they are related. They are possibly the easiest & most difficult games ever created! As someone who gets to work on alot of toy & game design, I think both of these concepts are awesome. 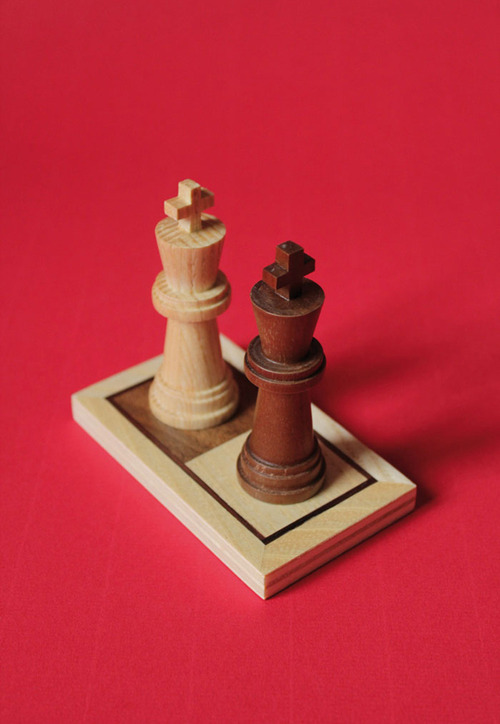 The first one is the easiest game possible, One-Dimensional Chess, consisting of 2 squares with a King on each. My 4 yr. old nephew is learning to play chess with his dad & my brothers. I can't stand the game and refuse to play. However, I might consider playing this version- as long as I'm the white piece & get to go first! The other one is probably the most difficult game possible! It is appropriately called "Risky Settlers, Knights and Allies of the Lords of Dominion of Earth, Pandemic Edition"
Cicada Sightings- The Invasion Begins! Here on the East Coast of the U.S., there have been reports of the insects known as cicadas emerging from their 17-year hibernation by the millions. When I was at my parent's house for a Memorial Day BBQ this weekend, my brother pointed out some cicadas on the plants. I got a closeup pic of one of these fairly large insects. Their molted remains were attached to the bottoms of the surrounding leaves. To celebrate the announcement that Michele Bachmann is not running for re-election in Congress, I'm re-posting the "Hypno-Bachmann" an animation I made awhile back of Ol' Crazy Eyes. ...Don't stare at it too long, or you WILL go insane. Good riddance to one of the most ignorant & divisive members of The House of Representatives! The House Republicans have had a membership that is strong in buffoonery, incompetence & know-nothingness. The lack of a meaningful legislative record under Speaker Boehner should be embarrassing for the GOP. However, Rep. Bachmann has been an especially unproductive & toxically corrosive Congressperson. Like the other ethically-challenged quitter, Sarah Palin, hopefully her only future is in the fringes of Fox News & right-wing talk radio. I'm sure she will find ways to continue eagerly feeding paranoid misinformation to the wackos that think she's some kind of populist hero. This year I had an awesome Memorial Day weekend. I went to 5 parties/BBQ's and got to see alot of friends & family, some who I don't get to see that often. 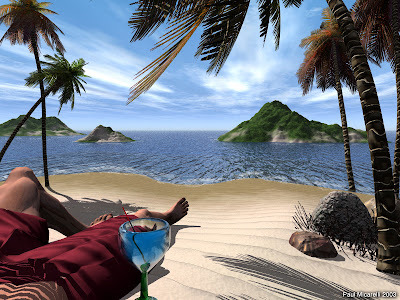 I'm posting this idyllic beach scene in anticipation of the hot summer weather & vacationing on the beach. Movie Review: "Iron Man 3"
Last night I went to see "Iron Man 3" in 3-D. Overall it was a cool movie, but I have a major issue with the way the main villain was handled that kind of ruined it for me. Back in the day, as a kid I collected comics. Though I didn't read alot of Iron Man, I'm pretty familiar with the stories & characters. I've enjoyed most of the Marvel superhero movies that have been coming out. "The Avengers" movie was by far the best comic book adaptation to date. Despite being very critical of superhero movies in general, I think the Iron Man series has been really good. Robert Downey Jr. is the perfect person to play Tony Stark. It's probably one of the best casting decisions in the history of cinema. The level of realism in computer effects is indistinguishable from the live footage. Even the most complex CGI, like the armor suit attaching itself to Tony Stark's body, is completely convincing. The amazing futuristic graphics & effects in the movie were even cooler in 3D. In the comic version, The Mandarin is a Chinese warlord who aquires 10 alien rings that grant him various powers. He is Iron Man's arch-enemy, like Lex Luthor to Superman. Instead, the trailers of the movie made it clear that Ben Kingsley was playing an Osama bin Laden type shadowy terrorist. He seemed to have an Eastern feel, but then he speaks in a western US accent?!? Why couldn't they just have him be a Chinese villain? Could they have really been worried about offending Asian people? I thought that approach was taking a lot of liberty with the character, but I tried to go into the movie with an open mind. As the story progressed I started to think, "Okay, this terrorist version of The Mandarin is pretty badass. I'm getting over my reservations about it." Then, out of nowhere, the plot took an absurd, shockingly stupid turn. About 3/4 of the way through the movie, Tony Stark finally infiltrates the villain's hideout. He finds out that "The Mandarin" is actually just a goofy goddamn British actor, who was paid to make videos by A.I.M., a tech & weapons company. The propaganda films are meant to deflect the fact that the terrorist acts were really the result of A.I.M. weaponizing people into human bombs. This is the result of Extremis technology, which is supposed to be a type of nano-tech that melds cybernetics & biological systems. For some reason, in the movie, anyone injected with the Extremis virus becomes a flame breathing fire-person. If they overload, they blow up, leaving no trace. Anyway, it turns out, the head of A.I.M., Dr. Aldrich Killian, is really behind all the mayhem- NOT The Mandarin! As this was being revealed, my brain couldn't even process what was happening. I was like, "What the hell is this? Is this guy a decoy for the real Mandarin? WTF?!?!?!" but, no, The Mandarin isn't even a villain, just an unbelievably idiotic actor. As much as I liked the rest of the movie... this really sucked. It was a horrible way to handle the character who's supposed to be Iron Man's main nemesis. I was astonished that anyone could have thought it was a clever idea. I didn't think you could mess up the character of a villain any more than Heath Ledger's portrayal of The Joker as a disheveled hobo clown... but I was wrong. "The Mandarin" was a total film adaptation FAIL. There were other things to nitpick that I didn't like, but it's late & I'm done hating on it. It was an entertaining movie, but I couldn't get over such a dumb surprise twist. Marvel & Disney should let me screen these movies before they are released, so I can set them straight on this kind of crap. 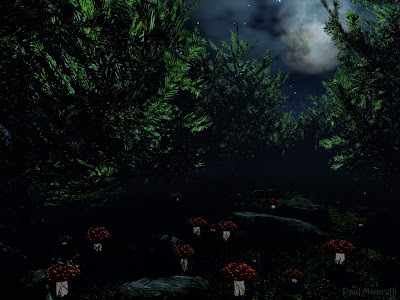 Even though the moonlit forest at night may appear to be quiet & still, it is teeming with all kinds of Life, vibrant and interconnected. 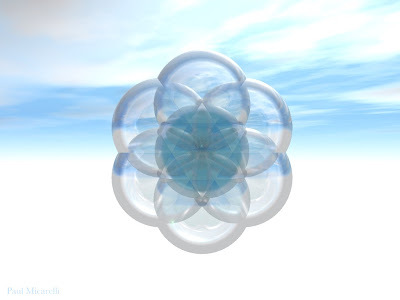 I created a series of 3D images featuring the pattern of circles known as the "Seed of Life". They were already uploaded to my album of 3D Art & posted here individually, but I wanted to also show them as a group. When I made them, I didn't really intend to make a series. However, when the pictures are placed in order- it looks like the mysterious geometric form is emerging from the primordial waters, rising through the blue sky, and into the cosmos. Once in the vast expanse of space, it's crystalline shell retracts & reveals the clear light of infinite consciousness. "Blue Sky Seed of Life"
On Gizmodo, I saw this link to this nostalgic bit of art history. There were scans from an old book about the art of photo retouching. 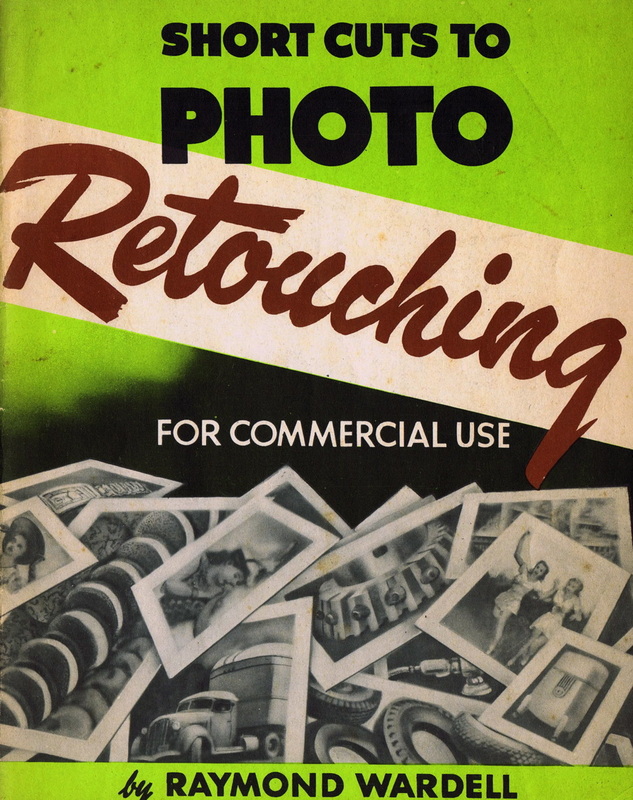 Before imaging software, namely Adobe Photoshop, the process of manipulating photos was a much more physical art form. When I was in college, waaaaaaay back at the turn of the millenium, I think the computer labs had Apple G3 machines running Photoshop 4.0. That was before the Internet was as ubiquitous as it is now, & the power of Photoshop was just beginning to open up the creative potential that exists today. 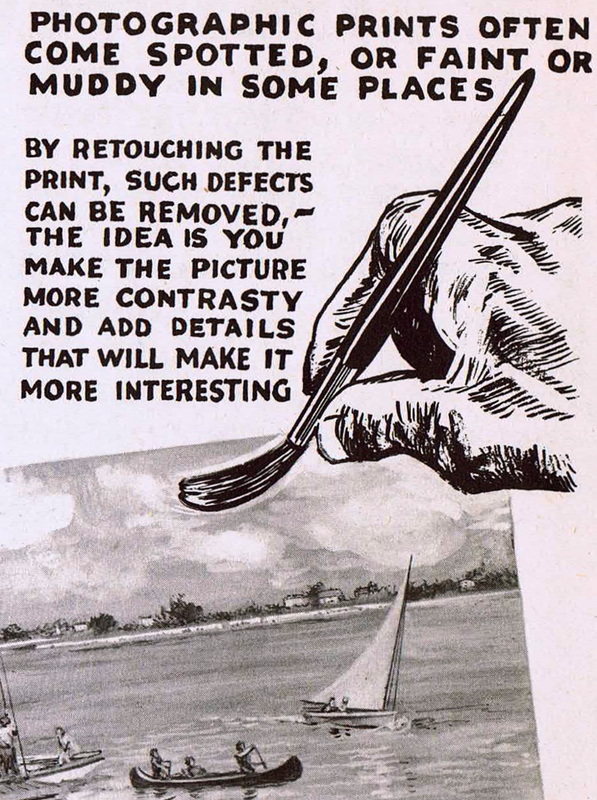 It was still a transitional period, so I learned traditional design techniques along with the graphics software. As a professional designer, I find that being aware of old-school tools & processes can sometimes inform or inspire solutions to contemporary problems. Sometimes, breaking the rules is much more fun & interesting. When we were younger, my siblings & I used to love the crazy cartoon Ren & Stimpy. 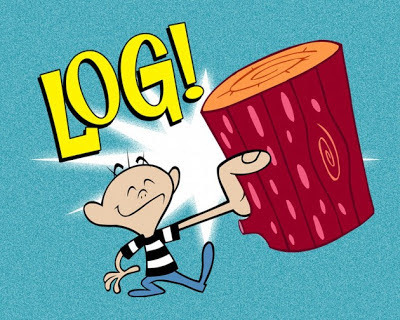 The commercial for the children's toy, "Log" is a hilarious spoof on consumer culture. It is one of the most memorable jingles I've ever heard. This is a cool painting by Mexican artist Octavio Ocampo. It contains hidden imagery & optical effects to illustrate man's progress from bipedal monkey... to machine-using inventor... to our future incarnation, which may transcend Einstein's conception of spacetime to become a non-localized quantum being. 'Evolution of Man' represents a 4-dimensional understanding of the human being and species. It is like stepping ‘outside’ of time, to see humanity as a continuous timeline of morphing forms. It shows the progression as a classic triptych. • The 1st part is our primitive hominid past, where we literally outrun our monkey body. Long-distance running is one of the unique evolutionary traits of humans. The large, superimposed face is that of an ape ancestor. • The 2nd part is the material age of industrialization and the physical sciences. This is the stage when people are occupied with mechanical technology. The large superimposed image is the face of a modern person. • The 3rd part is the cosmic/energetic future of humankind. After transitioning from physical technologies, the forms are breaking down into elementary particles and energies. Consciousness transcends the physical body & the light of the mind explodes into & throughout the Universe. The face superimposed over this area is that Albert Einstein, representing the inclusion of mind into science- through relativity theory and the emphasis on the experience of the observer. Also, his introduction of mass/energy equivalence through E=Mc^2 opened new horizons for the future of science, and therefore the human species. 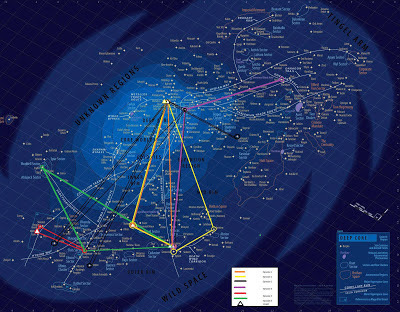 Overall, this is a type of multi-dimensional roadmap for the progression of humanity as a collective phenomenon. It shows our past, present, and future, with an optical superimposition of a face for each stage of the “”Evolution of Man”. 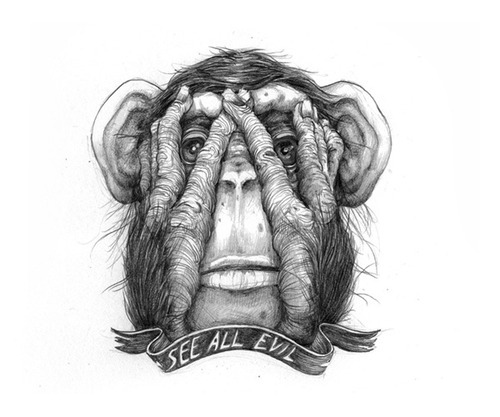 Like this monkey, I prefer to experience everything, which means being open to observing the good & bad. 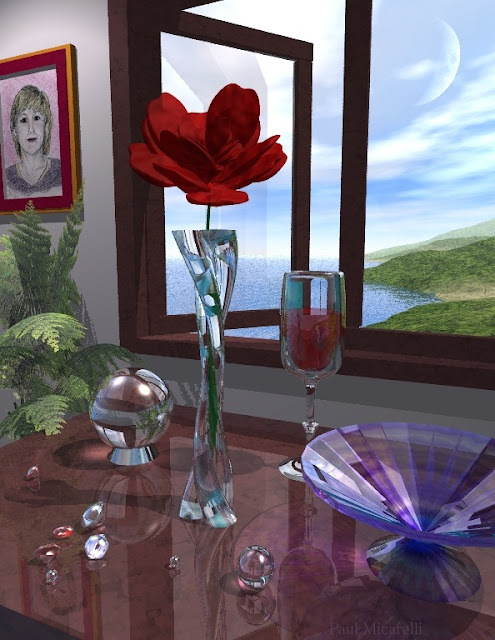 Since it's Mother's Day, I'm adding this still life that I made for my Mom, Karen, to my album of 3D art. While was making this, I scanned a portrait of her that I'd drawn & included it in the scene. She thought really liked it & still has a print of it hanging in the living room. It was inspired by a great woman who I'm fortunate to have as a mother. This is the final pair of a series that I created, depicting a 3D version of the sacred geometry symbol, known as the "Seed of Life". It is the core of the larger pattern of interlocking circles, "The Flower of Life". 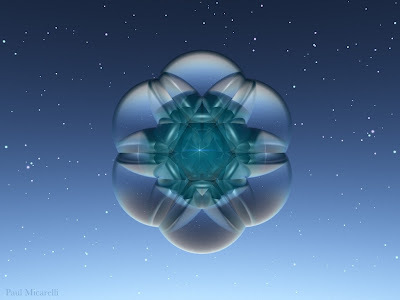 The Seed of Life, a vehicle of knowledge, has traveled the beyond the planet among the stars. It's protective shell has opened to reveal it's true nature- the clear white light that is the source of Creation. This is the 2nd of a series that I created, depicting a 3D version of the sacred geometry symbol, known as the "Seed of Life". 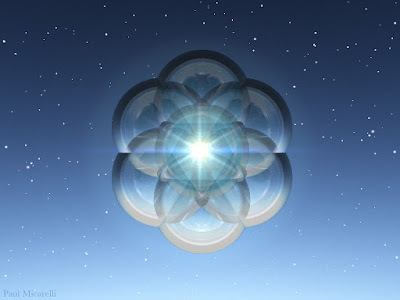 The 7 circles forming the Seed of Life is the symbol of Creation. The hexagram is the symbol of the divine union of opposites; male/female, solar/lunar, active/passive, etc. This is the 1st of a series that I created, depicting a 3D version of the sacred geometry symbol, known as the "Seed of Life". 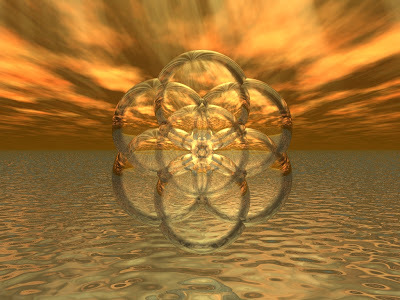 The 7 circles forming the Seed of Life, the symbol of Creation, rising from the primordial waters. I saw these on FFFFOUND! & originally thought they were really cell phones lined up next to each other. It turns out they are actually "Russian nesting dolls" or Matryoshka that fit inside each other. 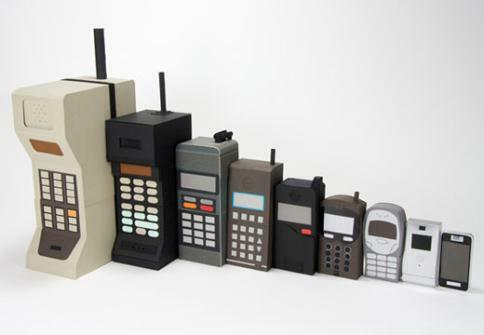 These models are pretty accurate, showing the steady evolution of mobile devices into the Apple iPhone- which I own & is now an indispensable extension of myself. May 4th has become Star Wars Day ("May the Fourth be with you! 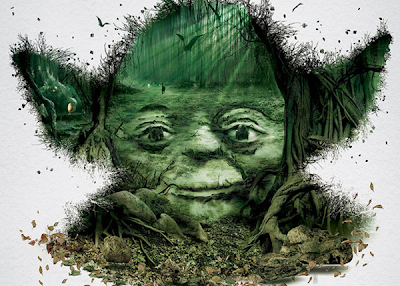 "), an unofficial day to celebrate all things from that galaxy far, far away. 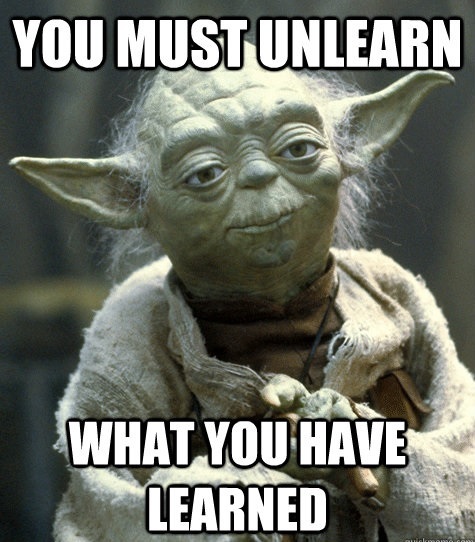 Star Wars came out the year before I was born, & it's one of my main cultural influences since I was a little kid. As I've gotten older, the movies & story have inspired me on all levels; philosophically, politically, spiritually & creatively It is one of those works of genius that will continue to be relevant, hundreds of years after its creation. Despite my appreciation of the sage, I've ranted before about the many problems with the movies. 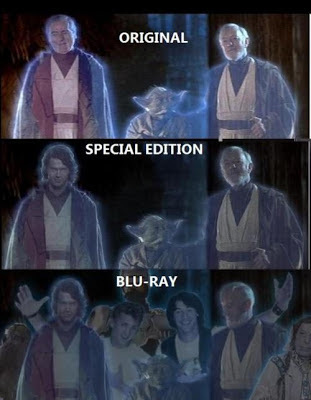 I maintain that one of the biggest, most unforgivable, mistakes is changing the end of Return of the Jedi by replacing Anakin Skywalker's ghost with a younger version. This makes no sense, and was a completely idiotic decision. Now that Disney has acquired the rights to the Star Wars franchise, everyone is anticipating the new movies that are in the works. I'm pretty familiar with the "Extended Universe" & always thought it would be cool if there were movies made that took place after Episode 6. I didn't really think it would happen, though. If the Marvel movies are any indication, I think Disney will be able to produce really cool movies. The fact that it seems like they are using the now-older cast of the original trilogy is a big step in the right direction. Hopefully they also take a few of the good ideas featured in Patton Oswalt's awesome & hysterical Star Wars rant. One interesting angle for the new movies would be to use the idea of the Yuuzhan Vong an invasion of aliens from outside the galaxy. The interesting fan theory on this page speculates that maybe Emperor Palpatine was actually using his military buildup & construction of the Death Stars to prepare for such an invasion, that only he anticipated. The Rebellion's "success" actually allowed the hostile aliens to overtake the capital city of Coruscant & cause havoc throughout the galaxy. 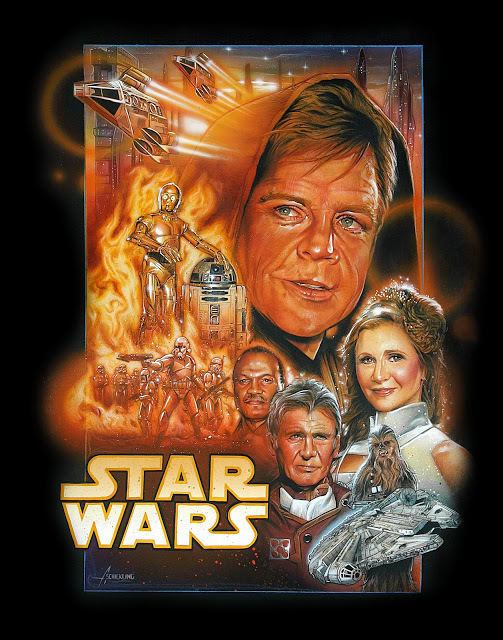 @jamieSWB - Star Wars Begins - The Complete Filmumentary from Jamie Benning on Vimeo. This is a very early 3D creation that I made in 2002. 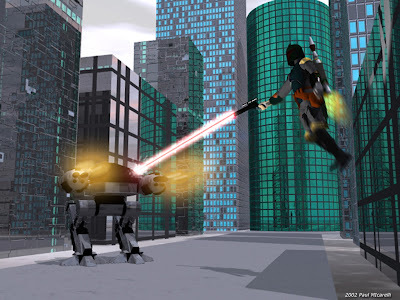 After finding mesh models of these characters, I decided to make a scene of the ED-209 robot, from Robocop, battling the notorious bounty hunter Boba Fett, from Star Wars. I've made many animated GIF images for my own amusement. GIFs are a uniquely digital phenomenon, since the looping animations need to bee seen on a computer screen. You can make all kinds of interesting animations using graphics software & 3D rendering. 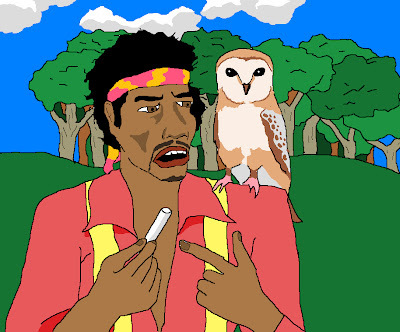 Here's a collection of particularly psychedelic images. "Turn On, Tune In, And Drop Out"
I saw this awesome Tumblr site on Sad & Useless. It is such a great idea & the results are hilarious. "Jim" takes people's completely insane ideas for a scene & brings them to life in the Microsoft Paint program. Like all Microsoft programs, MS Paint is crap. However, Jim makes excellent renderings of these fantastic imaginary scenarios. Please paint me a scene where Jesus bursts into Hitler’s bunker smoking a cigar and riding a T-Rex, while firing a Thompson machine gun with one hand and holding sticks of dynamite with the other, robes flowing, winking and smiling. 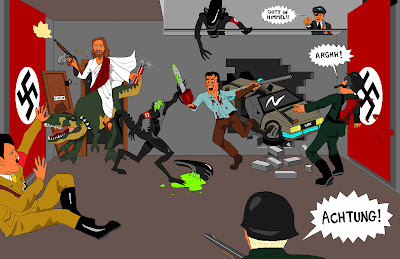 And at the same time the BTTF2 DeLorean has crashed into the bunker wall with Ash from Evil Dead II out the car shotgunning and chainsawing Nazis who speak in Commando comic German (Gott in himmel etc) and chopping through Nazi Xenomorphs from the Alien movie franchise. Please paint me Jimi Hendrix explaining to an owl on his shoulder what a stick of chalk is, near a forest.